Here we go again. In Tennessee, like many states in the Union, we test our students using standardized tests every April. In May and June, the results come out and the questioning begins. The last couple of years have seen the questioning get louder and louder. Last year, it was over a delay in test results. This year, teachers are taking to social media, questioning the quick scores because they seem abnormally high. Are they, though? Q47: Should I use my district’s/school’s quick scores for accountability determinations? Due to post equating and psychometric reviews on assessment data, quick scores might look different from final accountability results. Districts may aggregate their numbers for their own data analysis; however, these are merely estimates. There is always the potential for changes in scoring. In all cases, we do not keep a record of students for whom scores change. Quick scores are embargoed which means they are not meant for public dissemination. So that sounds pretty serious, but no more clear than it was before I checked. One thing was clear – that in order to interpret the quick scores you needed to know the cut scores. You got it, back to the web site. That’s where I found this: The index cut scores are an estimate of the number of items the student would be expected to answer correctly to achieve basic, proficient, and advanced designation if there had been 100 such items for each category. Okay, that’s not much clearer, but it’s clear that I needed the cut scores in order to assess the value of the quick scores. Clearly, this isn’t like Ms. Johnson’s 5th grade class where there were 50 questions and each one you got right earned you two points, and if you got between 80 and 90 points you got a “B,” 90 to 100 an “A,” and so on. Under the state scenario a student receives a score, say an 87, and what ever number the cut score is set at determines whether the student is proficient or advanced. If the cut score is set at 88, the child would be considered basic. If the cut score is 86, they are proficient. Sounds fairly simple, but there are questions about how cut scores are derived at. I want to thank you for your work in finalizing student demographic and teacher claiming information to close this year’s TCAP cycle. I know many of you have received your quick scores for student grading and are anxious to understand more about your district’s overall performance. Though the department made the decision in 2014 to stop associating TCAP performance levels with quick score results, we do want to provide information as accurately, transparently, and quickly as possible. I’m not going to try and decipher exactly what all that means. It is obviously way more complicated than I can handle, so I’ll leave that to smarter minds than mine. 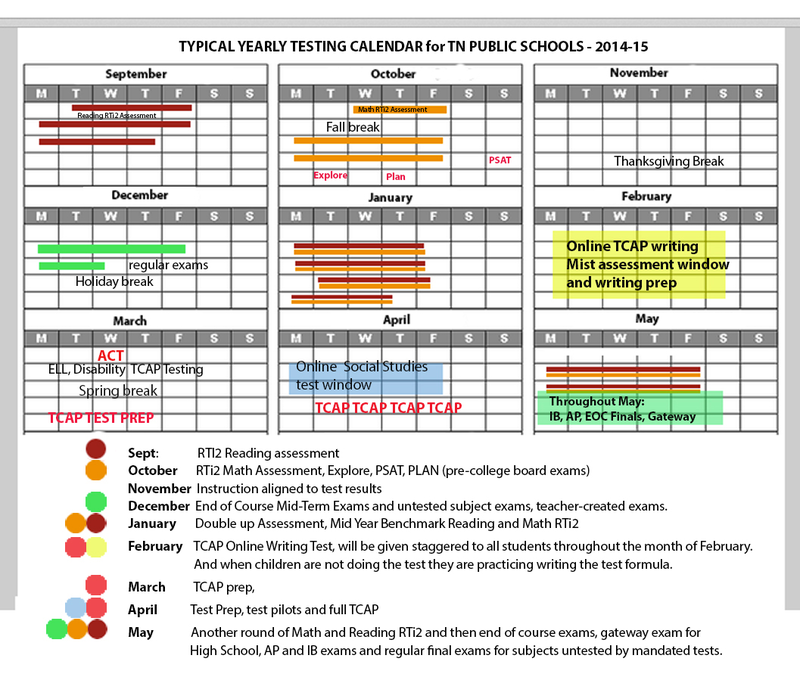 However, I do have a couple thoughts on our student testing system that I’d like to share. Some things that I do understand and I don’t believe can be said enough. Critics often say that we should run our school system like a business. Well, you can pick up any number of business books, and they will stress the value of having an evaluation system that stake holders all buy-in to. Without that buy-in, there is no value. If people don’t believe in the fidelity of the system, it becomes too easy to attribute outside factors to the results. In other words, they start to feel that data is being manipulated to augment an agenda that they are not privy to and not included in. I’m not saying results are being manipulated or not being manipulated when it comes to our student evaluation system, but I am saying that there seems be a growing belief that they are, and without some kind of change, that perception will only grow. I’ve always maintained that perception is nine-tenths of reality. That’s a lot of focus on something that nobody can give a clear concise explanation of. What if parents were given copies of the test their children just took and were permitted to review these tests with them? 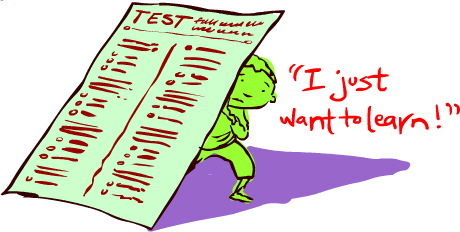 What if teachers were permitted to see tests and judge the strength of the test questions? What if teachers were given Unless the process was truly flawed, greater transparency could only increase confidence in the way we test our children. Perhaps if we spent as much time defending stakeholder’s proprietary rights as we did testing companies, some faith would be restored. Which leads me to my second thought and one that cannot be understated. We need to make sure that the public has a full understanding of exactly what a bell curve is and that it serves as a base for our measurement system. In a new posting, Jersey Jazzman, an education researcher and blogger, does an exceptional job of explaining how it all works. A bell curve is applied to the test results, and that means that some students will fall to the exceptional end of the scale and some students will fall to the other side, but the majority will fall in the middle. Let me spell that out further. While we are demanding that students do exceptional work, we are utilizing a measurement system that guarantees the majority of them will do average work. Because if too many of them do exceptional work, we’ll just make the test harder so that the majority fall back in the middle. Let’s take it a step further. Since the evidence is pretty strong that standardized tests are a better measurement of socio-economic status than actual learning, who do you think will fall to the lower end of the curve? That’s right, our low income children and our children of color. Reformers will latch on to these scores to create strategies like charter schools, extended school days, and no-excuse discipline policies. They will apply these strategies predominately to our low income children and children of color. I recently brought a magician to a high-poverty elementary school to entertain the children. A teacher came up to thank me and made the comment that they don’t often get opportunities like this one due to the testing scrutiny they are subject to. Kids in poverty get more focus on what is measurable while wealthier kids enjoy a more well-rounded education. When was the last time you heard a call for longer school days in a wealthy district? What about the need for a no-excuse discipline policy? A test that just reinforces socio-economic status will just serve to create two separate and unequal education systems. At a listening session for the upcoming Project RESET in Nashville a roomful of education professionals offered very insightful assessments of our educational system when the owner of a local charter school spoke up and proclaimed that we can talk about engagement, parental involvement, and diversity all we want, but we need to focus on achievement because 13 percent of students are not proficient in reading and to her that was unacceptable. To me, it sounds like she has a lack of understanding of how the system is designed, and that based on that design, the system is working. Because if that 13% ever became proficient, we would just adjust the test to make sure that either they or some other students fell back into that non-proficient status. Starting to feel like it’s a rigged system? It should. At a luncheon the week before, in front of hundreds of civic leaders, Nashville Public Education Foundation, a main sponsor of Project RESET, president Shannon Hunt proclaimed that all students have the identical potential to achieve. Apparently, she hasn’t looked too closely at our measurement system because under that system, only a few have the chance to achieve at a high level, lest we, again, adjust the test. Many in the room will use those words to justify further privatizing a system that is already under attack, and again it will be our poor children and children of color who will be affected. In Tennessee, we have the Achievement School District, which has the mission of taking the bottom 5% of schools up to the top 25% while ignoring the fact that there will always be a bottom 5%. The use of a bell curve goes one step further and insures there will always be below average schools and teachers. Or, as the reform movement likes to label them, failing schools and failing teachers. How many parents and community members are aware of this, and how many take the results at face value? Since NPEF is sponsoring Project RESET to reset the educational conversation in Nashville, this discussion of test scores and failing schools might be the area to start the reset. Perhaps we could have an honest conversation about what standardized test tell us. Students are not alone in being held to a higher standard in a system that only allows a high output for a few students. Countless articles have been written about the need to have a great teacher in front of every class, yet each of those teachers will only be allowed to produce average outcomes. Because again, if all those teachers produced great outcomes, we’d have to redo the test to make sure those outcomes were average. I can hear the critics shaking their heads now. You’re oversimplifying it, they’ll say. They’ll point out that’s why there is an observational portion and a growth element added to the teacher evaluation system. And what happens when that observational portion produces results different than the test? We say the observations are biased and we re-address the scores. It’ll be interesting to see how it all plays out this summer. I don’t know if Tennessee needs high test scores to fortify the narrative that reform is working or low test scores to reinforce the need for the move to Common Core. I suspect I’ll know by the end of the summer. I do know that at some point the state will have to address the growing lack of faith in our evaluation system. At some point we will have to stop demanding that children produce at a high level in a system that guarantees the majority will produce at an average level. We will have to face facts that our evaluation system aids in the creation of inequalities and fails to give us a true picture of student outcomes. That is perhaps Candice’s biggest challenge. The ethical use of standardized test scores is such old style thinking. It’s just not modern enough. Maybe Candice or the lege will compromise and just use half of the bell curve to judge kids & teachers. Now that’s up-to-date thinking. I have no idea how my students did on the English II EOC. We don’t know which questions they got right/wrong. I don’t even know how to explain their scores. 83 was the cut score, yet I have a student who scored an 83 but was not Proficient. We need to SEE THE TESTS! As for Project Reset, I gave students a handout telling them about it. The handout ended up on the floor and in the trash. They didn’t care. But the politicos and edupreneurs sure do. Actually, if the cut score is 86, they are proficient. If the cut score is 88, they child would be considered “basic.” Whatever “basic” means. The advanced category score is unknown. I really did like your logic though. I think the Q 47 text you referenced is outdated on state website. It is true that actual performance data is embargoed over the summer but the last few years “quick scores ” have been uploaded as grades printed on grade cards and are therefore public since grade cards are handed out in every district in the state. So the state has to clean up its info on website for the curious public. Perhaps I am in error. It’s been a mite confusing lately! There’s a lot that’s misstated in this article. Still ita that Tennessee needs to get its act together when it comes to education. I don’t know why we keep trying to reinvent the wheel, when we could just take a page from the regions of the country that are doing it well (aka most anywhere in the NE). But this quote got to me: “In Tennessee, we have the Achievement School District, which has the mission of taking the bottom 5% of schools up to the top 25% while ignoring the fact that there will always be a bottom 5%…” It sounds funny on first read, but the writer is misrepresenting how the curve is utilized. As the parent of a 2e student, I’ve had to get REAL familiar with this specialized way of noting what’s wnl (that’s ‘within normal limits’) and what’s not. And there really is a science to it. But it takes a EduPsychPhD to explain it to those of us who are not specially trained. Let the heads who understand these things write about them, so that the rest of us might come to understand them as well. Gloria, I appreciate your feedback but I respectfully disagree in regards to the ASD. The reason that several school schools were in the bottom 5% this last year was because Memphis closed several schools. Nothing scientific about that. Chris Barbic continues to use the slogan of 5% into top 25% as a means to turn the ASD into a de facto charter authorizer. That’s well documented and as the parent of a child in one of those potential bottom 5%, who is very pleased with my child’s progress, I don’t find it humorous at all. As far as the use of a Bell Curve goes, I’m not completely against it’s use and agree that it does have a scientific basis, but let’s have an honest conversation about it. We shouldn’t need a EduPsychPD to explain our children’s performance.